High performance Ultra Thin Vga Cable Male to Male Tri-Shield Fully-Wired Ultra thin VGA Cable with Interchangeable Mounting. 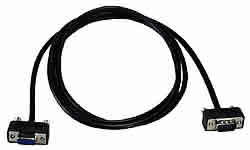 This cable carries a resolution of QXGA 2048 x 1536. 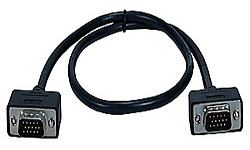 This cables carries a QXGA resolution 2048 x 1536 and is male to female. Connects any VGA/QXGA video to any computer, switch or splitter with HD15 female port. Supports all monitors including analog flat panel display, high resolution desktop, CAD and graphic workstations. It is fully-wired for maximum compatibility with both PC and HDTV applications. UltraThin diameter provides space-saving design and flexibility not found on regular VGA cables. Interchangeable mounting allows you to replace the thumbscrews with included stand-off screws and can be mounted on a face plate. Please Note: QXGA provides a screen resolution of 2048 x 1536pixels.